This blog post was inspired by podcast Episode 108 with Monica James, in which we discuss everything from how to find out which colleges track demonstrated interest to whether you should or shouldn’t like a college’s Facebook page. You can find that episode here. Spoiler alert: In this blog post I’ll share with you a list of potential Action Items that involve (among other things) attending college fairs, speaking with admission reps, and maybe even opening a few of those emails that colleges send you--things that might stress you out. And why, you might wonder, would the “ease, purpose and joy” guy ask you to do things that mostly bring you anxiety? Why are we talking about demonstrated interest in the first place? That’s right, it’s #7. TWO SPOTS BELOW ESSAYS. For the entire 2017 NACAC state of college admission report, click here. And get this: according to a 2012 NACAC report, between 2004 and 2011, the percentage of colleges that rated demonstrated interest as being “considerably important” rose from 7% to 23% (see page 23 of the report), although since then it has stayed right around the 20% mark. while you're here, you might as well check out my blog post on how to create a great college list. 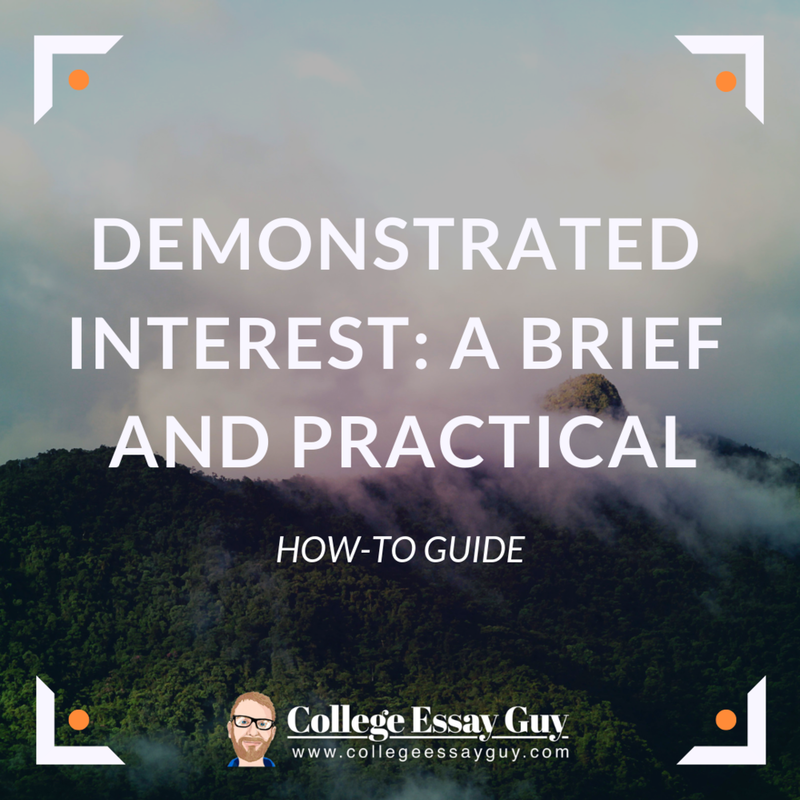 Simply put, demonstrated interest is something that many colleges and universities use to track a) how much you (prospective student) like their school and, more importantly b) how likely you are to enroll if the school admits you. 1. Schools have a target enrollment number, which means that each year they want a certain number of students to enroll. Why? Think about it: if they enroll 200 (or even 20) too many students, they’ve got a problem: where do they put everyone? Similarly, if they enroll 200 (or even 20) too few students, then they’ve got a different problem: 20 or 200 empty dorm beds. And when you multiply that number times that many tuitions, it can add up to a really big reason (or, if you like, millions of reasons) why schools want to try and hit their target enrollment number. 2. Schools want to protect their “yield.” What’s yield, you ask? It’s the percentage of students who decide to enroll at a particular college or university after being accepted. So, for example, if Northwestern offers ten spots to ten students and all of them accept, that’s great for them! That means Northwestern is a great place to be and everyone loves Northwestern yay! But if the school offers ten spots to ten students and only one student accepts, then that’s bad. Why? Because then they seem like that one giraffe at the zoo that none of the other giraffes want to play with. #sadgiraffeemoji Why else is it bad? Because yield is tied to a school’s ranking in US News and World Report, which is a place that some parents and students look when deciding which schools they should apply to. (Here’s a better way to build a college list, bee tea dubs.) Put simply, if their yield gets worse, this can have a negative impact on their rankings. And can you blame them? If you were running a college, wouldn’t you want to know who was not only likely to enroll, but also likely to stay all four years and graduate? Quick personal anecdote: In college I applied for a job at a Mongolian BBQ restaurant in Evanston, IL and they required me to come to not one, but four interviews. Four interviews! The first interview went great, but I was ten minutes late to the second interview and, when I showed up late, the hiring manager said, “Sorry, we won’t be hiring you.” I asked why and they said, “We just really value punctuality and this shows us you don’t really share that commitment.” And at first I was like, “Daaang,” but then I was like, “Yeah, you’re right.” By showing up late I was basically demonstrating a lack of interest in the job. That hiring manager was saying what schools are saying: Show us you care. Like, actually care. Oh, and you know those 42 questions that you answer when you sign up for the SAT? Some colleges pay for that info too. So those are, y’know, 42 other things they track. Side note--and you can skip this if you wanna’ get to the practical stuff: At a party last night (yes, actually) I met a business analyst for the development office of a highly selective school (and “development office” folks are those who call alumni asking for donations) and she let me know that student engagement is tracked even while students are on campus and--get this--even after you graduate. Why? Because a student who attends alumni events may be more likely to donate. Fun fact: they even use something called “wealth screening” to find out how much money you might have. Yay for data! Okay, given this information, what should you do? 1. Nothing. That’s right. You can just keep getting good grades and participating in the activities and projects you love and keep living your awesome life. So there is literally nothing that you have to do differently now that you know this. For real. You can still get into a great school without demonstrating interest. 2. Spend some time developing your college list. Why do this first? So that you don’t stress yourself out trying to “demonstrate interest” for like 20 schools, some of which you may not apply to anyway. Here’s a resource for creating a great college list, for free. See: LMU doesn’t track demonstrated interest! So stop demonstrating! Wow, schools publish this info? Yup. For more schools, check out the huge Wiki list of Common Data Sets at this link. I’ll make this really simple. You might consider demonstrating interest if a) there’s a school that you’re super excited about attending and b) that school actually tracks demonstrated interest. If You Decide You Want to Demonstrate Some Interest (and It’s an Important “If” Because We’re About to Go Down the Rabbit Hole! ), When and How Should You Do it? Okay, with all those qualifiers in place, here are 13 ways you can demonstrate interest, adapted from a great article by Lisa Rubin-Johnson. Note that I’ve added how much time each one should take because a) the word “practical” is in the title of this post, and b) it’s a great way to help you make sure you’re doing this with ease, joy and purpose. Get on the school’s email list. (2 min.) You can do this by Googling the name of the school and filling out an “information request” form like this one. Attend a college fair. (2-3 hrs.) Check out our tips for making the most of a college fair experience. Contact your regional rep. (10-30 min.) More tips on developing an authentic relationship with your rep below. Visit campus. (Time spent depends how far away you live.) This isn’t possible for everyone, but if you’re within a couple hours from the school, it’s a good idea (if you do live close to the school and never visit, a school might wonder why). Make sure they’ve got some record you were there by signing up for a tour or meeting with a rep.
Interview. (1 hr prep + 2-3 hrs driving to and doing actual interview) Some schools have interviews, some don’t--you can find out by Googling--if yes, do the interview. An alumni interview is fine; an interview with your regional rep (i.e. the person who is likely to read your application) is better. More tips on interviews at this link and note that at that link I address, “Does the interview matter?” For schools that track demonstrated interest, the interview matters. Supplemental essays. (You’ll have to write these anyway if you’re applying; time will vary.) The big one is the “Why us” essay, where essentially you get a chance to show the school why you feel you’d be a great fit for one another. If the school is (actually) your #1 choice, say that in your “Why us.” Lots more tips on how to write that essay at this link. Apply Early Action or Early Decision. (Takes pre-planning, but no extra work to do beyond actual application.) Early Decision (ED) is something you can do for only one school and means that, if you get in, you have to go. Early Action (EA) is something you can do for several schools and, if you get in, you don’t have to go, but doing so shows you’re interested enough to apply earlier than most students. A few schools have something called Restricted Early Action, but make sure to check the school’s website to see which school offers what. Why might you apply ED or EA? Because the ED and EA acceptance rates are often higher. How much higher? Wouldn’t it be great if a resource existed that compared the difference between regular decision and early decision numbers? Behold: a PDF that compares Regular Decision and Early Decision percentages for 2016. You can thank Jennie Kent and Jeff Levy for the time it took them to contact all the schools on this list and put together all this info. (Thanks, Jennie and Jeff!) Keep in mind that students applying early often have stronger applications and more access to resources, so the applicant pool for EA and ED is sometimes stronger. But still: look at the difference in acceptance percentage for regular decision and early decision applicants to American University. (Spoiler: 32% for RD and 82% for ED.) Think it matters? Uh huh. Submit your application before the deadline. (No extra time required.) This is especially true for schools that read applications on a rolling basis (in other words: in the order applications are submitted). As Monica James says on the podcast, better to be the first oboe player that a reader reads than the sixth! Thank you notes and emails. (10-15 min.) Hello, life skill. Spend a few minutes following up after an interview or college fair meeting with a little, “Thanks for talking with me!” You can even ask a follow-up question, if you’d like to keep the conversation going, but don’t go crazy (see tips below for more on this). Follow the waitlist instructions. (10 min-2 hrs, depending) If you’ve been waitlisted by a school, make sure you do whatever they tell you to do--including the optional stuff. They may for example just ask you to fill out a simple form declaring your interest (10 min. ), or they may say that you can submit one additional recommendation letter or a short letter detailing any additional information not included in the original application (if they do, send the one--not six--rec letter, and in the follow-up letter you write, only include new information, as they've asked). The school website will tell you what to do; if you can’t find the info, give the school a quick call to ask what to do and take careful notes. Hey Ethan, this all sounds exhausting and I don’t feel like doing it. Great, then don’t! You do not have to do any of the 13 things mentioned above. Colleges will still read your application and you will be considered for admission. Assuming you have good grades and test scores, you have followed all the directions on the application and (this is important) assuming you have developed a balanced college list, you will still end up at a great school where you can get a great education and find happiness. But before you decide not to do anything, remember: You don’t have to do all 13 things for all 9 or 10 schools you’re applying to and you certainly don’t have to do them all in one day or even one week. You could just pick a couple schools that you’re 100% certain actually track demonstrated interest, then pick a few things from the list of 13 things and do those. Focus on building on authentic relationship with your regional rep from 2-3 schools on your list. If the rep is coming to a college fair near you, go and meet them! Especially if you won’t or may not be able to visit the campus. And if you’ve already met the rep because they visited your school, still go and just say hello. College resumes don't have to be intimidating anymore. here are my best college resume templates for 2018. “Oh, he’s in,” the rep said. But he was serious. “Oh, even Bs. He was the student ambassador when I visited his school and he showed me around--he’s a great kid and we’d love to have him.” I don’t know if that student ultimately ended up at that school, but his demonstrated interest game was on point. Okay, that’s enough for you to do and think about so I’m gonna’ cut this off here and let you either get to work or get back to your life. Check out that PDF that compares Regular Decision and Early Decision percentages for 2016, as it can help you decide if you want to apply ED or not. Get to work on your college list, so you can decide which schools you may like to apply some of the 13 tips to. That’s all. Now go back to having an awesome life. 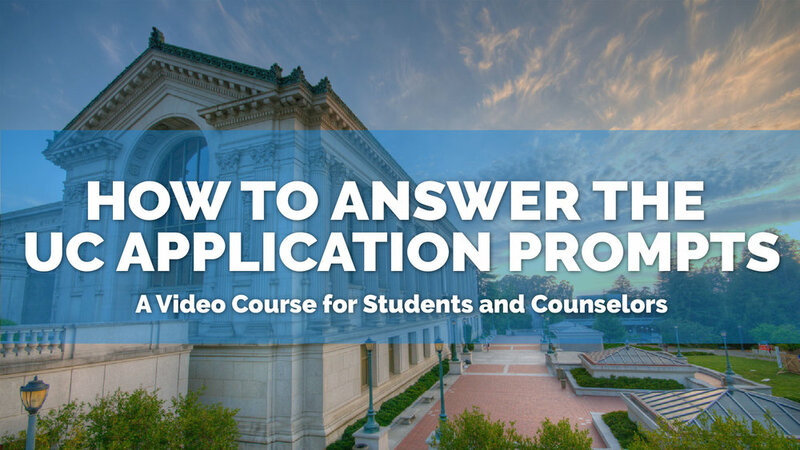 lOOKING fOR ANSWERS TO THOSE INTENSE UC APPLICATION PROMPTS? lOOK NO FURTHER. cHECK OUT MY COURSE.